Odds are you have likely passed by this place and never noticed it before. It’s at the Atwater entrance of the Pepsi forum just as you proceed to the AMC, there’s that resto on your right hand side. Before going in I had my reservations that it would be too commercial and chain-like but I put all prejudices aside and tried it out. It also helped that we were a group of nine all coming for a special occasion…eating 🙂 The layout is pretty straightforward with a host/hostess at the front and seating spread out all over the place. The entrance and washrooms are wheelchair accessible which is a very nice touch that few places have – so hats off to them. With a group of nine at the table the food options become quite interesting. Also, its a great way to make a dent in their menu which offers a lot of choice. The menu offers some dishes all day long while others are only until 4:00pm and the price range is quite fair with many dishes being at or under $10. The smoothie menu offered 8 tasty options at $4.99 each and for an extra $2.99 you can add a shot of rhum, tequila or vodka. In theory, the extra booze isn’t really worth it, since in my books the only acceptable breakfast booze is a mimosa and beer (yes, it is a breakfast drink). The next section in the menu is called the “Breakfast Feast” which offers a variety of dishes ranging from $7.99 to $14.99 although most of these are priced under $10 since only three out of the thirteen are above $10. Each of the dishes in this section comes with fruit, bread and potatoes. 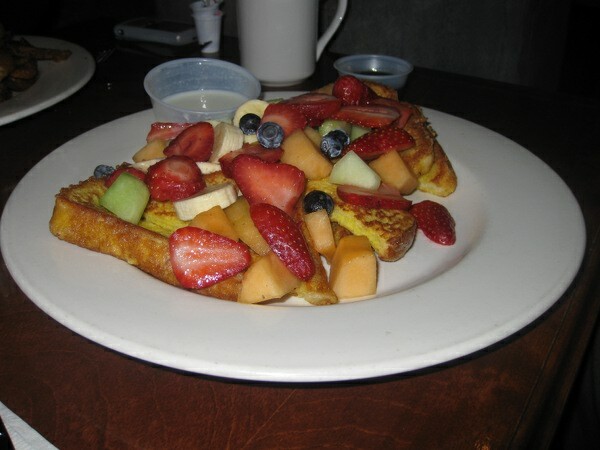 This section is quite varied with classic eggs and bacon dishes as well as steak and eggs, flambé French toast, latke dish, mish mash, eggs and smoked meat to name a few. In fact, we ended up ordering a couple plates from this section. The prices were fair and the portion size was quite generous. 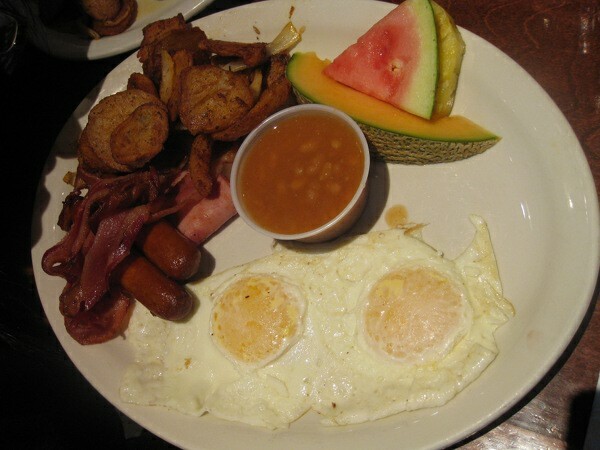 The “Rise and Shine” ($9.99) was a classic 2 eggs served with bacon, sausage, ham and baked beans. 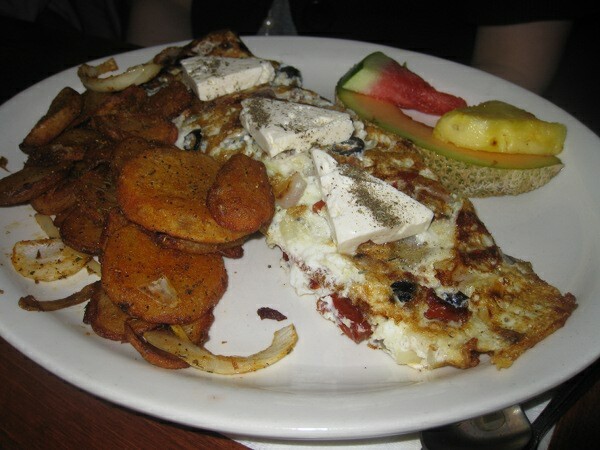 There are no real complaints on this dish since its a classic eggs dish, the potatoes that came with it were fair and the fruit was tasty and fresh as well the price of $9.99 is a decent price. 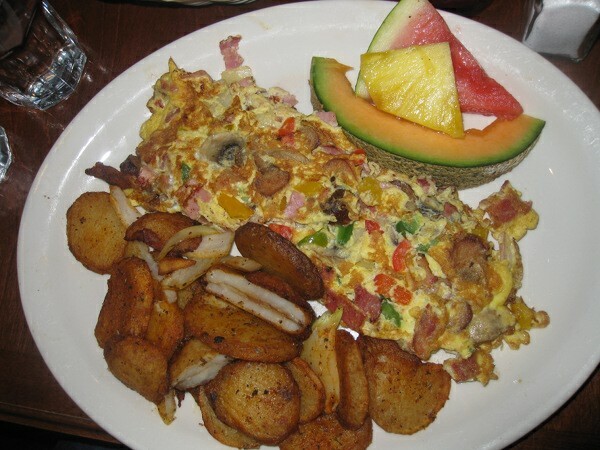 Next on the list was Micheal’s mish mash ($10.99) which is a 3 egg omelet served with mushroom, onions, peppers, bacon, ham, smoked meat and sausage. The dish was filling and the taste truly delivered. There was the eggs and steak at $13.99 which I did not get a chance to sample, although it is my friend’s favourite dish she orders every time she goes there. 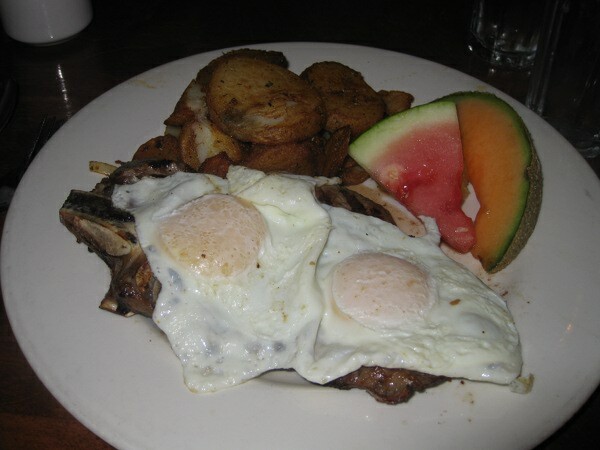 I would assume its just a steak with eggs and to be honest, steak and eggs is my brunch weak point – I never order it on the menu so maybe next time I will try that one and broaden my culinary horizons. Another dish ordered was a Mexican Crepe ($13.99) which had chicken, peppers, cheese and onions, with a guacamole spread on top. I was afraid to try this dish since it looked like something I would likely try for dinner but I was very impressed on how it made a welcome addition to the brunch feast. The last dish on this menu section was the pancake and eggs ($8.99) and it was as it read: basically two pancakes, served with 2 eggs and a side of potatoes, sausage and fruit. The pancakes were filling although a touch on the sweet side, kind of like the French toast which a little more sweet than I would like. 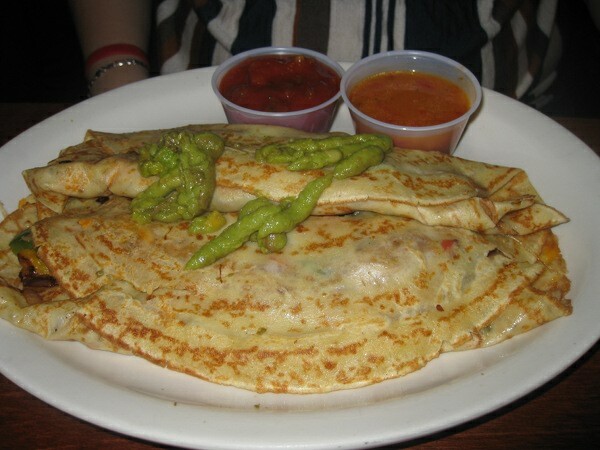 There a good number of vegetarian options as well as health menu items the omelets are mainly vegetarian as well and most dishes that came with a side of meat can be requested to be dropped or swapped. Also, the bagel and yogurt section has over 12 options and of varying prices ($4.99-$12.99). As for vegan options its pretty much fruit plates since many dishes have a dairy aspect in them. 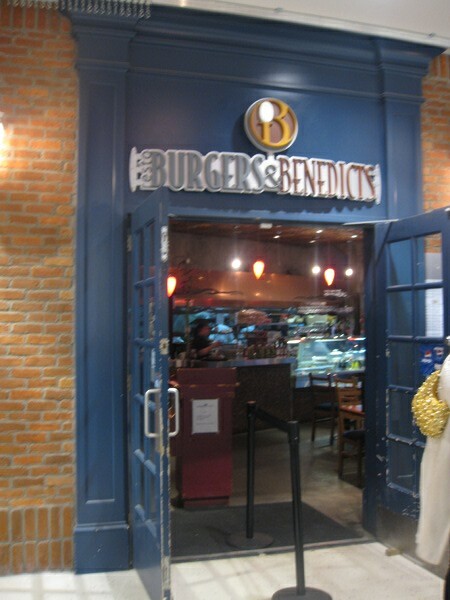 I was happy to try out Burgers and Benedict, I found some very interesting dishes and for quite a reasonable price, my only criticism is that the French toast thickness is not up to snuff and the toast bread on the Benedict needs to get swapped to an English muffin. All this being said if your in the area check it out. This is my second experience with this place it was ok but I will never go back. The first time I went i got a burger and asked for honey mustard on it and they said it would come as a side and asked me for 2.00$ I was like uhh no wtf i just meant spread a little on with a knife like any other burger place. It does have the name “burger” in the name. 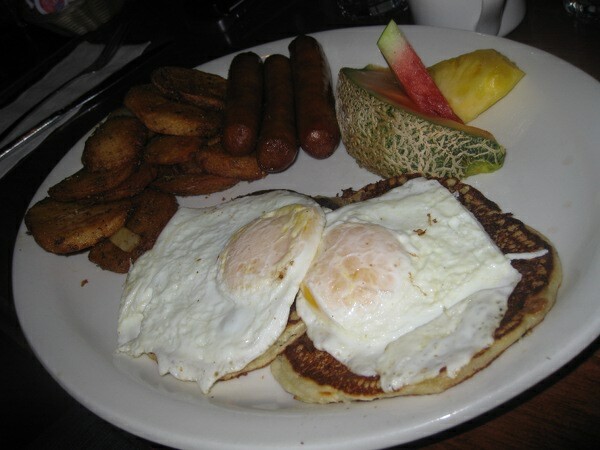 The second time, today i went for breakfast and i had eggs bacon and sausage I only like break fast sausage with table syrup or maple syrup but when I am out table syrup is just fine because I know it is expensive. They try to charge me 99cents for it. OK umm i eat breakfast out all the time and I have never been charged for this it is a part of breakfast, are they going to start charging for ketchup and mayo soon also? like for real raise your prices and don’t be so danm stingy with the little things it just pisses consumer of. I live across the street and will never have anything there again. Really hated this place. They give 1 pack of syrup for a whole dish of pancakes and they charge 99c per extra pack …ok…listen just add 2 dollars to the price of the dish and give me proper maple syrup. Both smoothies we tried were bad. But the one reason we won’t go back: I asked for sunny side up eggs and I got them raw. When I told the waiter, he came back with this answer: “anyone who eats sunny side up is looking for trouble. they’re going to be raw.” now that’s service! Have visited this place on four occasions-twice for breakfast and twice for dinner. The first breakfast occurred a few months after it first opened. It was pretty good. The second breakfast was more than a year later. Still pretty good except that my friend found a thick hair in her omelet. The plate was replaced for free even though she had already eaten half of her meal. The waiter was ok but seemed to give off an f-you-you fussy-b-why-am-I-working-here-when-I-could-be-playing-video-games-vibe. The first dinner, a regular burger, was tasty and adequate (not gourmet but not at all crap). This was about a year and a half ago. The second dinner, in June 2010 was disappointing. The waitress was very nice, sweet, and patient, but the place had that slightly crummy, seen better days feel. The tables and floor were a bit dirty-bits of dropped food, little smudges of dried sauce or something on the table etc. It was pushing greasy spoon level. Some places at our table did not have cutlery and they did not have enough staff. Our waitress really did her best to be there for us though. The burger, same as last time, was good but the lettuce in it was going bad and so was the side salad. It was that mesclun or spring mix that you can get at the supermarket and had several leaves tha were not just wilted but smear on your plate mushy. I got a chocolate milkshake but it tasted like cheap diluted vanilla ice cream with chocolate syrup in it that was hand mixed or blended together for 3 seconds. It was a bit thin and there were several small lumps of crunchy, ice filled ice cream in it instead of being uniformly smooth and creamy. I was really disappointed because this place was on my good but cheap list and I had recommended it to my friends. One of my friends had a warm chicken wrap that had mango, or honey mustard in it (if I remember correctly) and although she found it passable, the meal was like eating that pre-fab, add water, heat and stir kind of food that you get at St-Hubert’s. Boring tasting. Anyway, I hope this place improves but I really don’t think I’ll be going back. Place has closed down. Still on its way to becoming a Java U.